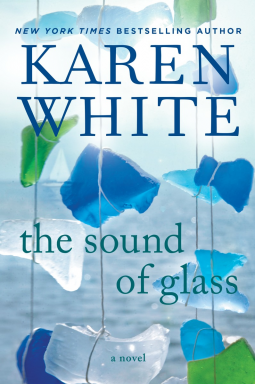 “The Sound Of Glass” by Karen White is one of the most brilliant books I’ve read in recent history, and I do read, a lot! Deep in mystery, rich in emotions, brimming with secrets, “The Sound Of Glass” will take you on a journey of abuse, courage and the pain of loss as it explores the relationships of four individuals in a kaleidoscope of colors, as they try to understand each other. Merritt comes to Beaufort, SC when she inherits her dead husband Cal’s ancestral home. And right on her heels, her young stepmother Loralee and her ten-year old stepbrother Owen, she’s never met in her life end up on her doorstep. And she also inherits the Cal’s brother Gibbs and a family steeped in secrets that she’s never heard of. As these unsuspecting characters converge under a single roof, what we get is an amazing story of insecurities, pain, loss and fear. As Merritt, Loralee and Owen try to bond, the mystery surrounding Cal and his grandmother, gets deeper and deeper. As Merritt gets to shed her inhibitions, Gibbs is right there to support and encourage her to grieve without guilt. As Loralee goes on a path of no return, she leads Merritt on a path of self-realization, acceptance and a life that should be lived like there’s no tomorrow. As Merritt tries to leave the glass house, Owen teaches her the nuances innocence, love of siblings and the bond that makes a family. “The Sound Of Glass” should be read to understand the characters, the depth of relationships, and the power of fear, forgiveness and acceptance. Words do not do justice to this book and you feel the impact of the story only when read. This is no edge of the seat, adrenaline pumping, steamy story, but true to the value of family, ethics and the consequences of secrets within a family and them impact it has on its members and the ones that follow. I’ve never read Karen White before, but this is a brilliant start for me. She does a stupendous job of keeping the narration tight to the minutest of detail, interchanging between decades yet keeping the story tight. The progression of relationship between Merritt and Loralee should be read, to enjoy them to the fullest. This is one fictional relationship that will stay with me forever! Received an ARC from Penguin Group Berkeley NA via Netgalley for an honest review.